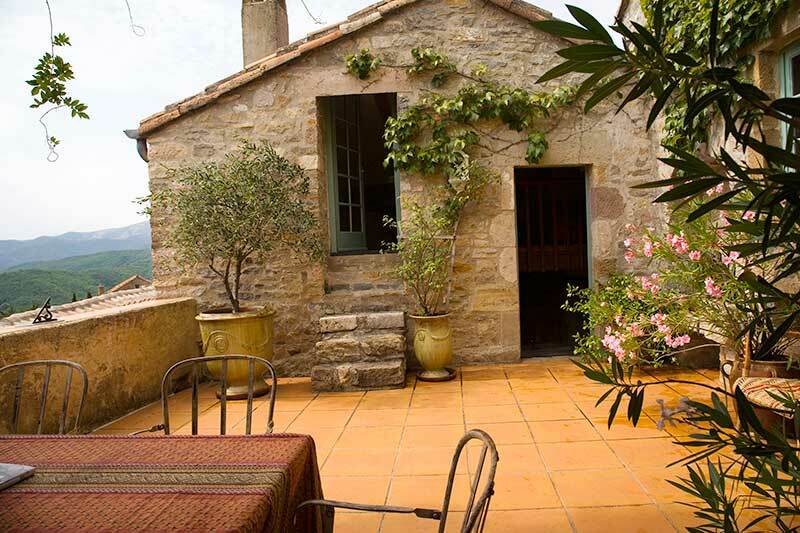 La Bastide d'Esparon is a haven with breathtaking views in a sunny authentic Cevenole House.It is a big stone house on 2 floors with its 3 private terraces, it is like having your own big home with 3 private terraces. 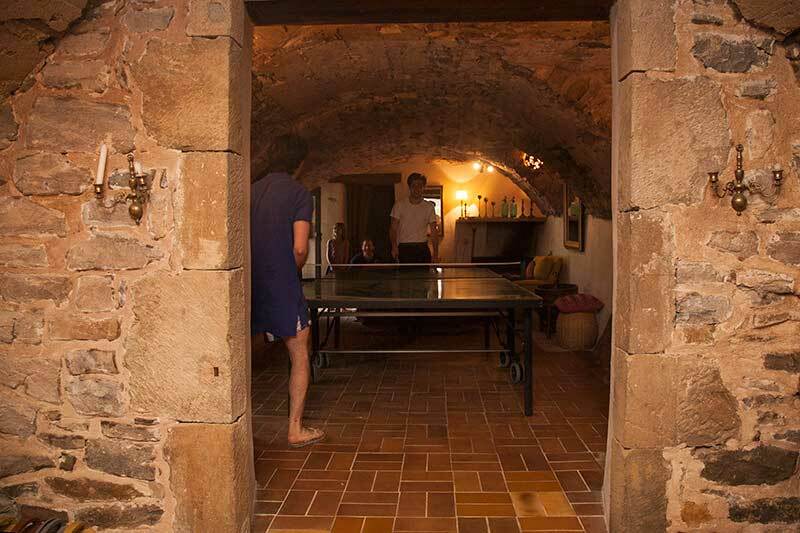 The house is on two floors Le Haut and Le Bas which are connected by a terrace and an interior staricase with a door. Each floor has a sperate entrance for the privacy of each party. La Guest House is independant and connected by a terrace. 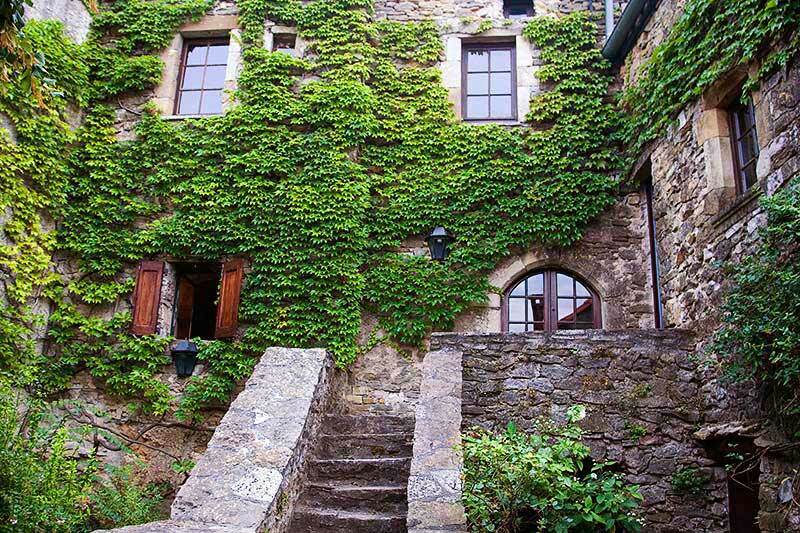 You may rent 'LE HAUT' only, if you are 4 to 5. 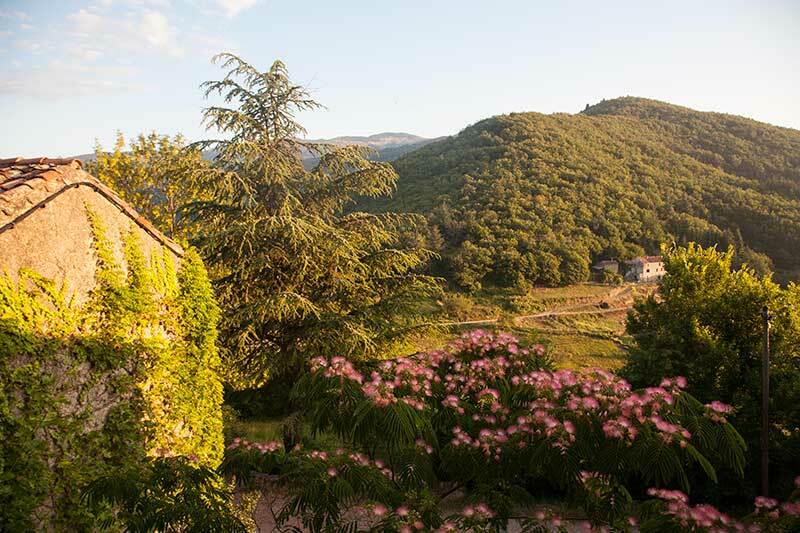 You may rent 'LE HAUT'+ 'LE BAS', if you are between 6 and 10. 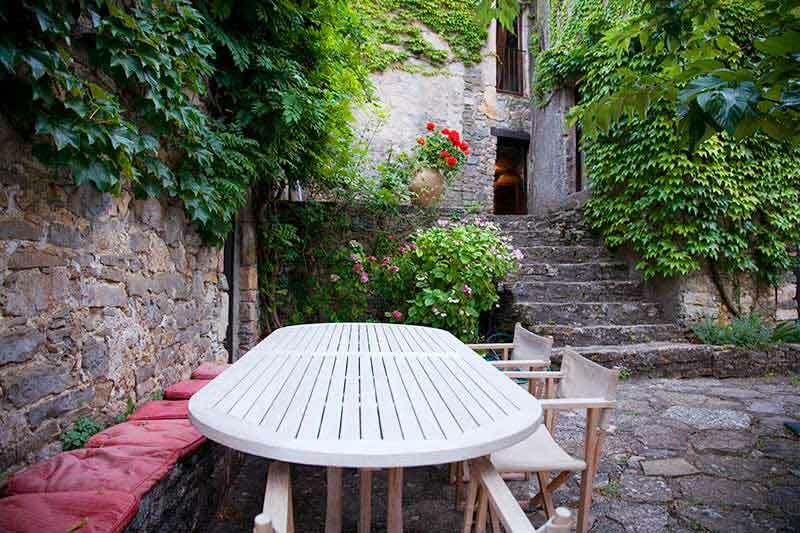 You may rent 'LE HAUT'+ 'LE BAS'+ 'LA GUEST HOUSE', if you are up to 14. 5 Rooms of which 3 bedrooms (and a Studio). Sleeps 5. "Master Bedroom": 1 Bedroom for 2 with a Double Queen Bed and a big studio space/private living room which is a family room. 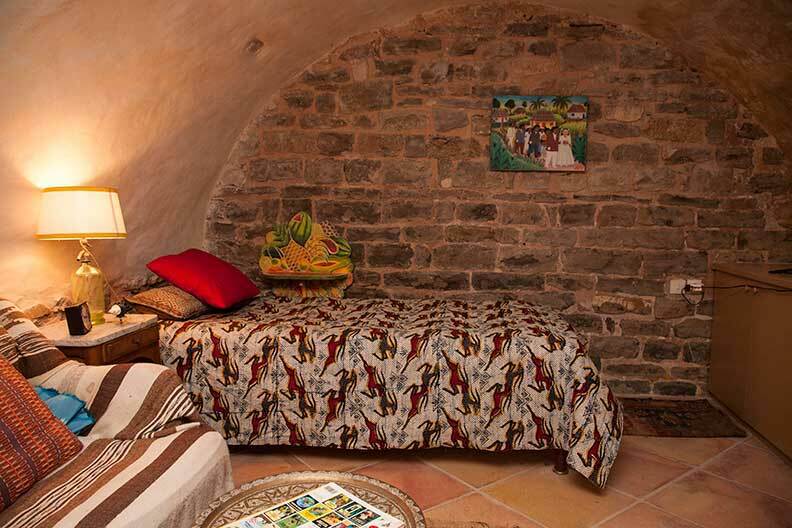 "Chambre Orientale": 1 Bedroom for 2 with 2 Single beds (which can be transformed into a Queen). 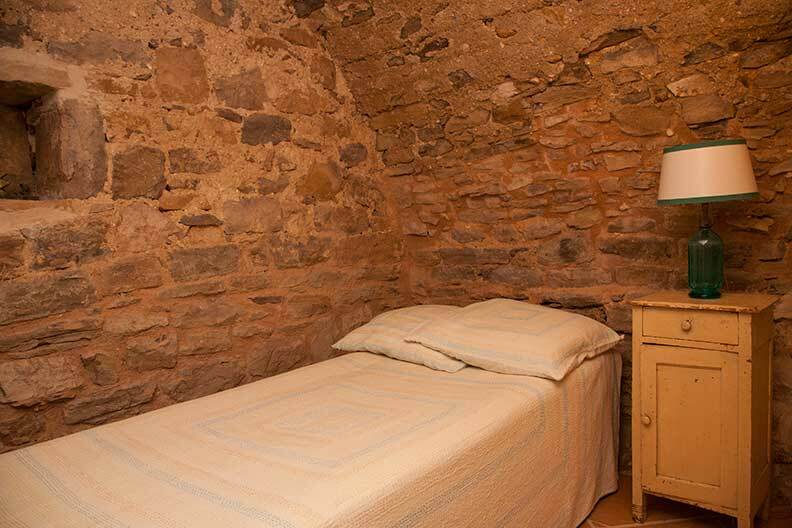 "Chambre Mansardée": 1 Bedroom for 1 with a Singlen bed. 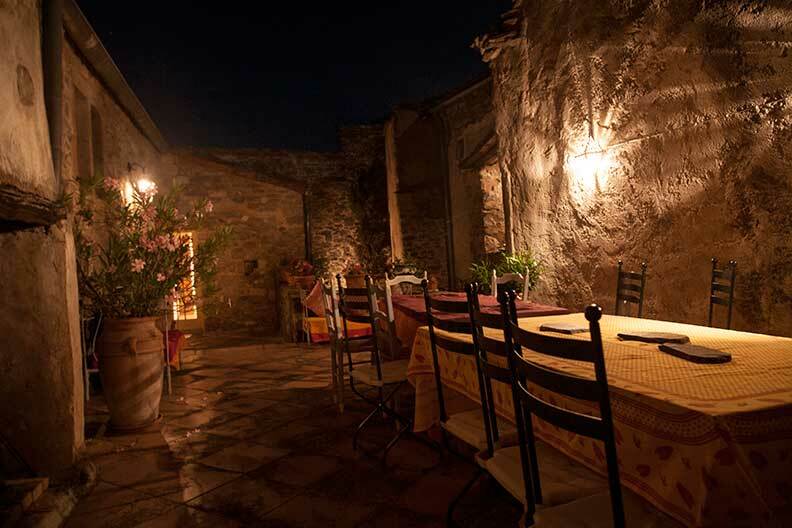 1 Big Interior Terrace with outside fireplace, barbecue, table for 10, lounging sofas, parasols. 1 Southern Terrace with spectacular Views and a table for 6 under a wisteria. 5 Rooms of which 3 bedrooms. Sleeps additional 4. Living Area: 180 square meters and high vaulted rooms. 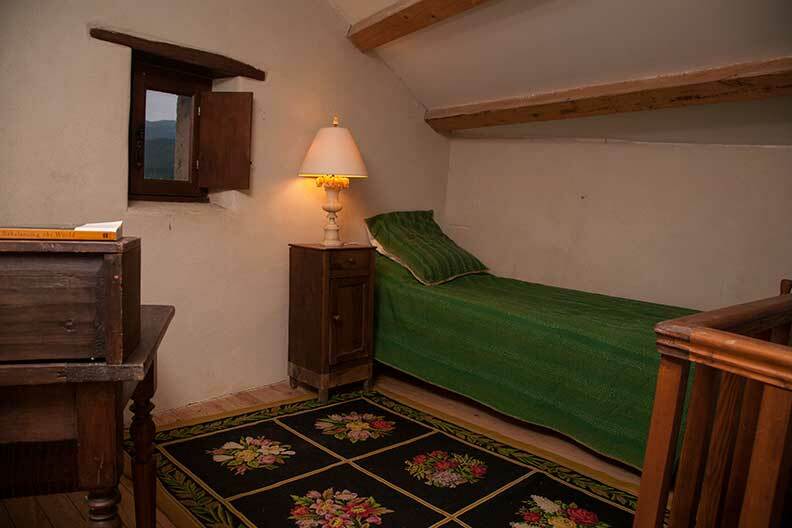 "Chambre Mérovingienne": 1 Bedroom for 2 with 2 Twins or single beds. 1 Big Terrace with outdoor Barbecue, table for 14, 4 lounging chairs, parasols. 2 seperate Bedooms. Sleeps additional 2-5. "Chambre Voutée":1 Bedroom with a Double Queen bed. "Chambre Elevée": 1 big Family Room with 1 Double Queen bed and 1 single and a desk for 3. 'LE HAUT' + 'LE BAS' + 'LA GUEST HOUSE: 360 square meters with 12 rooms, 8 Bedrooms, 4 bathrooms, 2 Kitchens, 2 Living Rooms, One Suite, 3 outdoor Terraces, 1 Barbecue, 1 indoor Fireplace, 1 outdoor Fireplace. 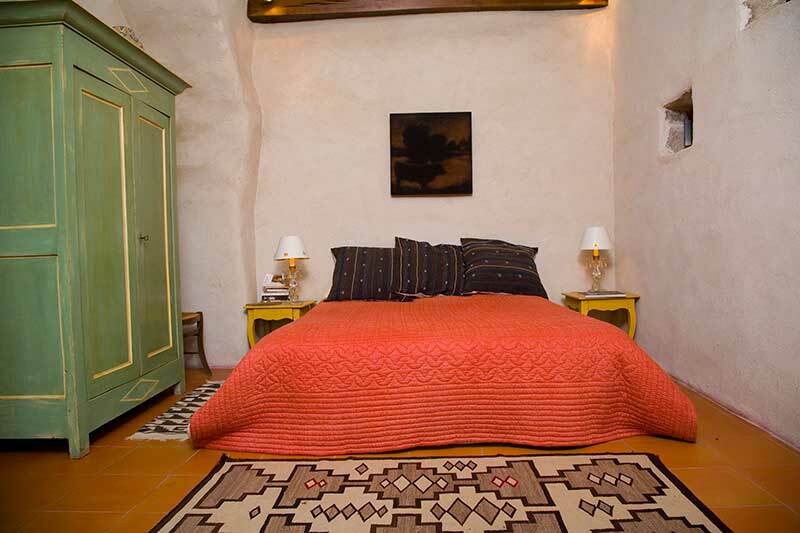 Le Haut: Master Bedroom with old Provencal Commode, Boutis, vintage navajo rug and John Robshaw hand-stitched pillows. Le Haut: Master Bedroom: View when you wake up. Le Haut:Southern Terrace. The wisteria protects from the Sun when it gets too hot. 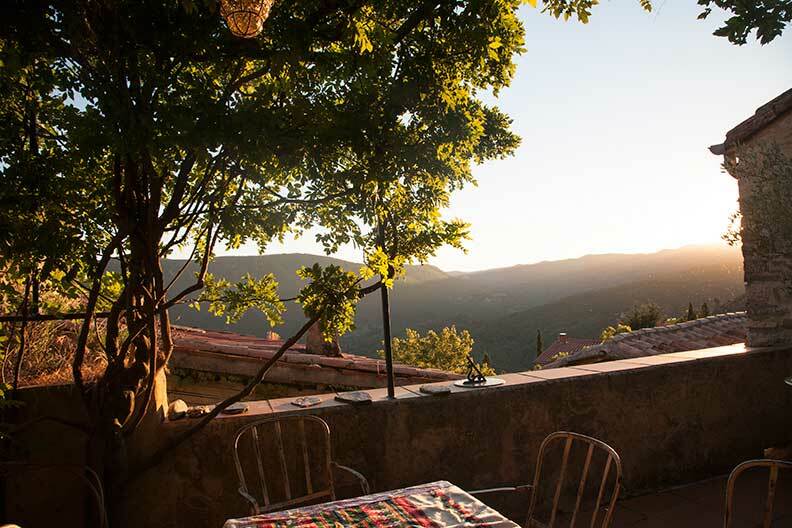 Le Haut: Southern Terrace with breath taking views on the rolling hills of the Cevennes. 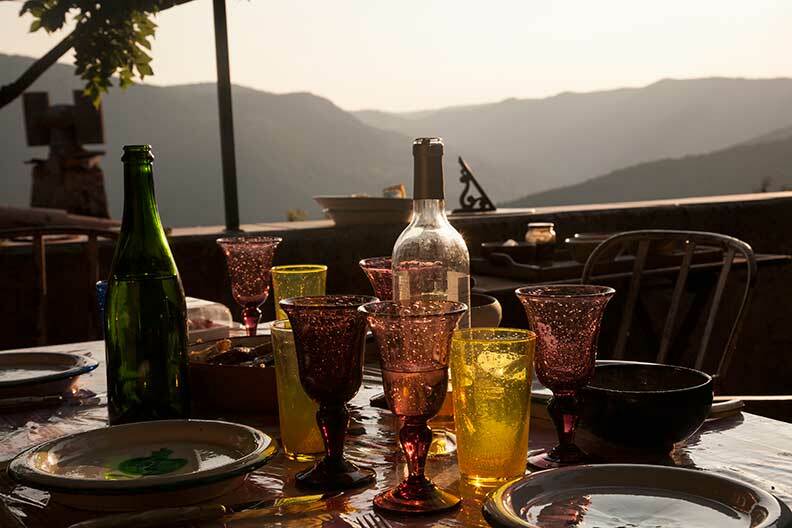 Le Haut: "Southern Terrace': Rose in Biotte Glasses. View on the mountains at sunset. Enjoy it in the Biot hand-lbown glasses. door to the Orient Bedroom in the back. 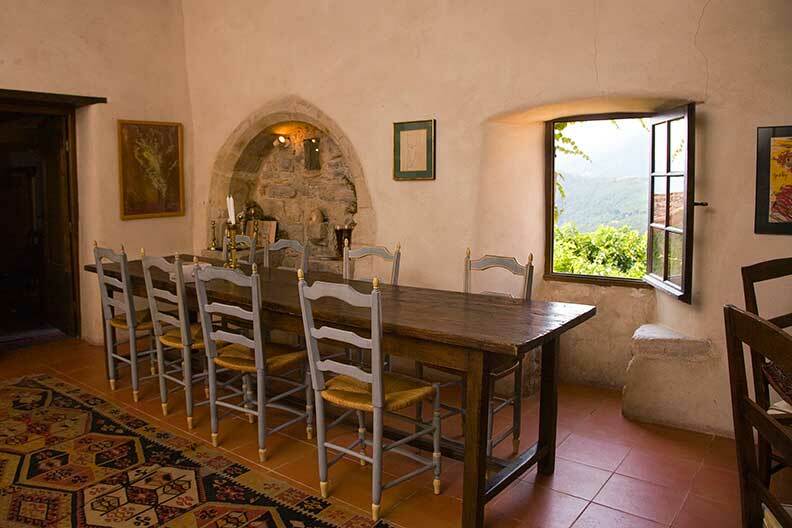 Le Haut: DIning Room which can sit 12 to 14 with medieval sink and view onthe mountains. 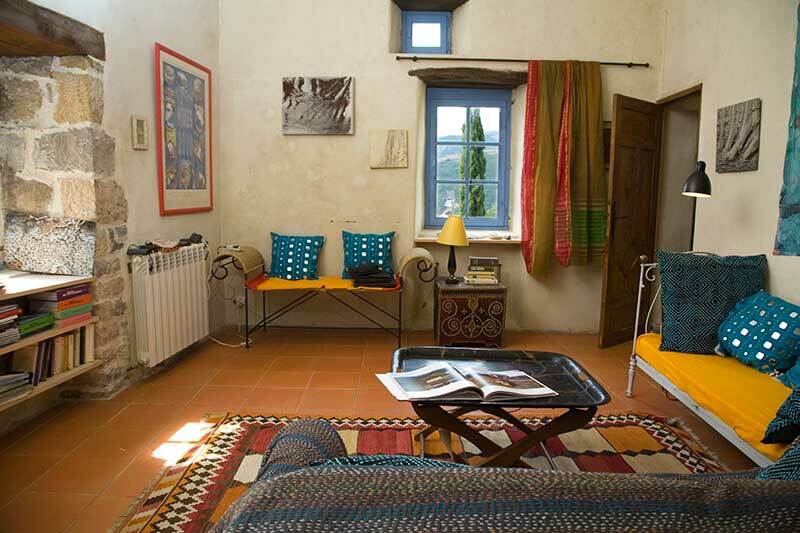 Le Haut: Master Bedroom's Suite-Studio with wifi internet and TV, View on South Terrace (detail). On the right door to Master Bedroom. Le Haut_Entrance with gate and private courtyard. 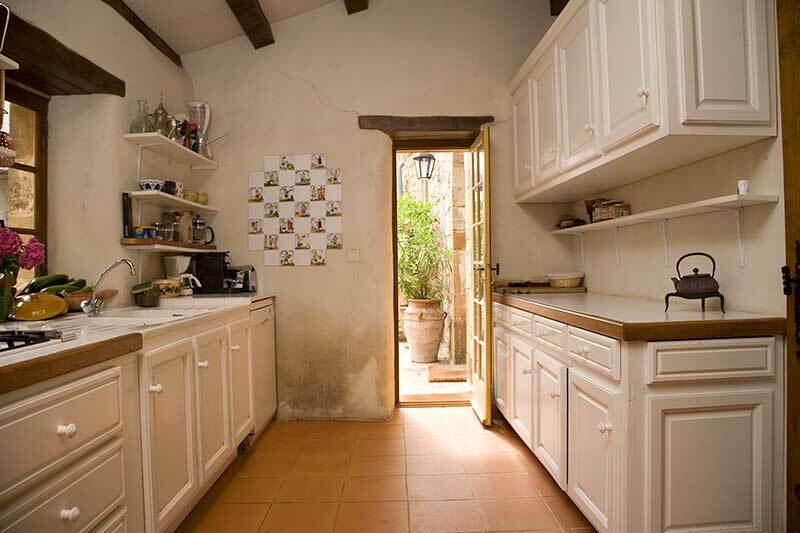 Le Haut: Interior terrace and main entrance to the Living Room and kitchen. 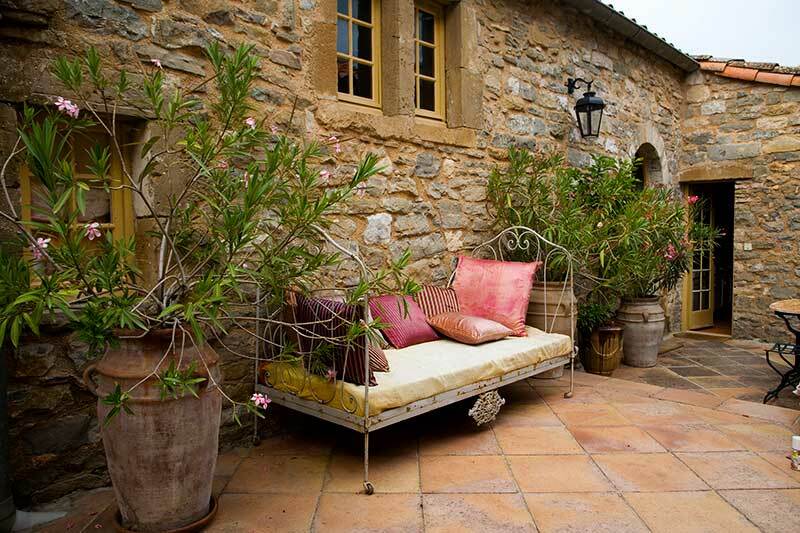 Old iron beds from Provence. Le Haut: Interior Terrace with table for 12 on the right and outdoors fireplace on the right for barbecues. Le Haut:: "Chambre Orientale". Eastern Exposure. twin beds, can be transformed into a double bed. 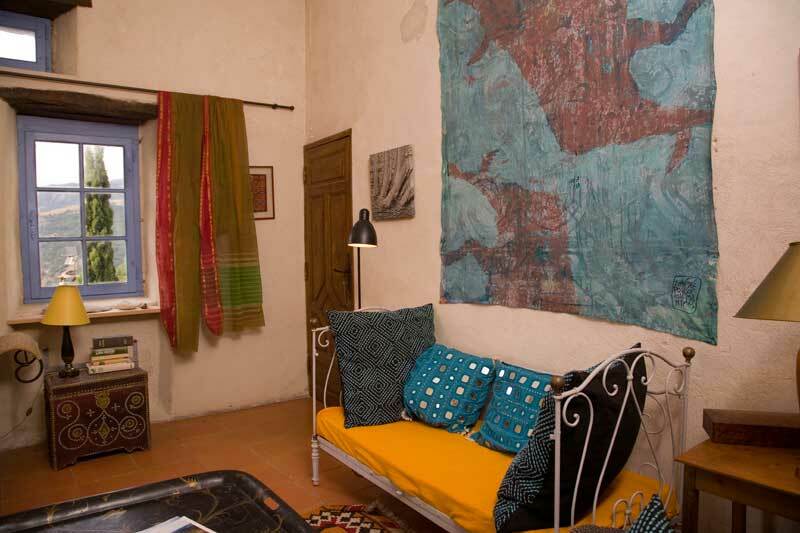 Le Haut: "Chambre Orientale". View on the garden with the albizio and the moutains. 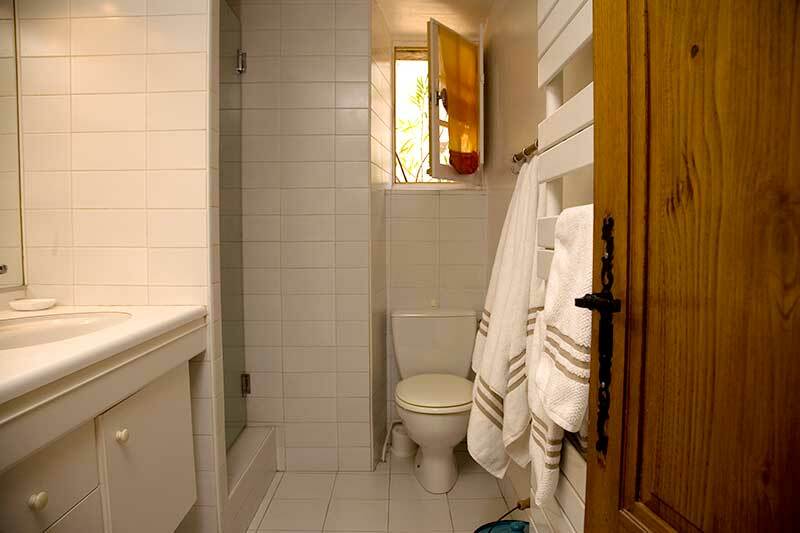 Le Haut: Master Bedroom's Bathroom with 2 sinks and a big shower room. Le Haut: Main entrance. 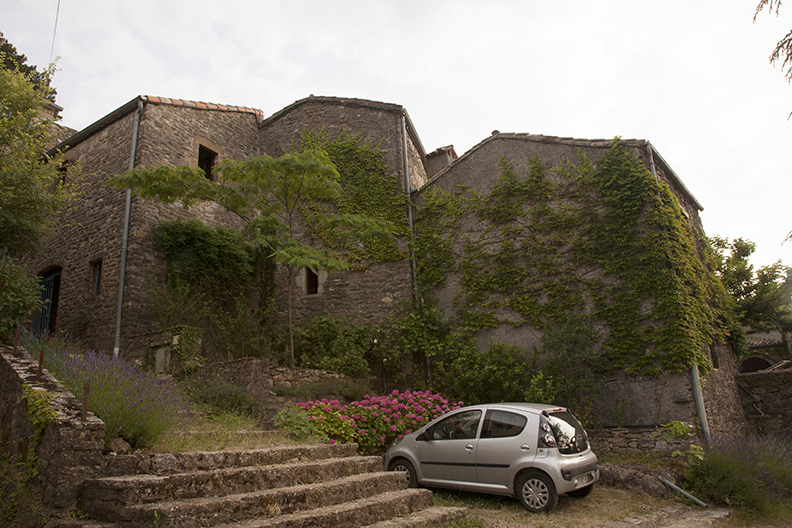 Side View.You can park your car here, go up the stairs, pass the private gate and into the private courtyard. You are home. Le Bas: Grande Terrace with a big table for 14 to 16. Le Bas: "Chambre du Moine"
La Guest House and Le Bas: Grande Terrasse with lounging chairs for naps. View on door to the Chambre Voutee entrance in La Guesst House. 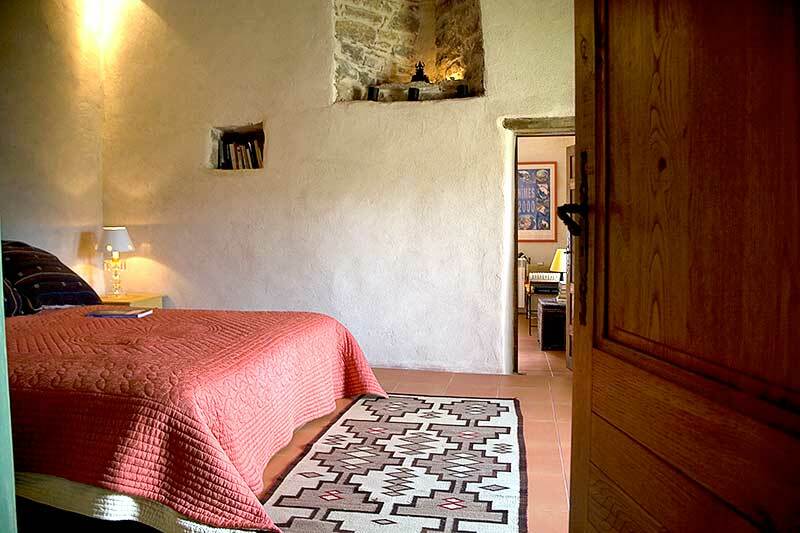 La Bastide du Haut is light, everywhere are lovely kilim rugs and pieces brought back from the owners’ travels - fine old wooden chests, antique wardrobes, paintings, books. 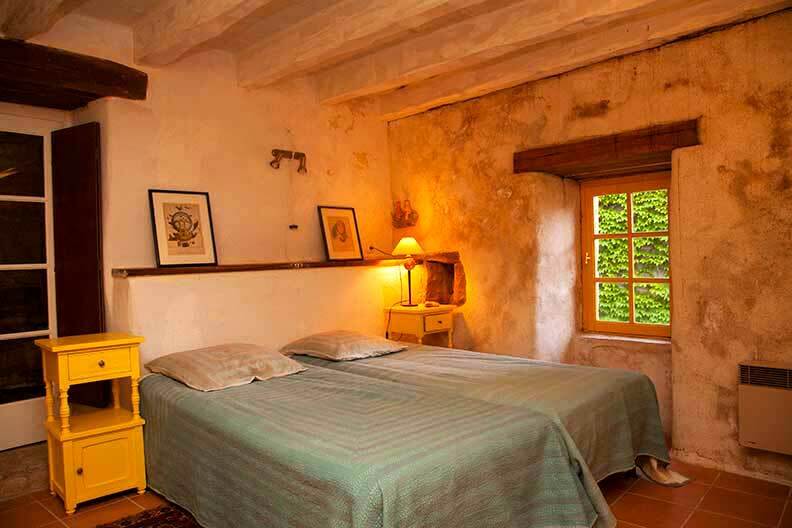 La Bastide du Bas has vaulted ceilings, two of which cover a pair of dark, enfolding bedrooms lifted by pretty stitched bedcovers. 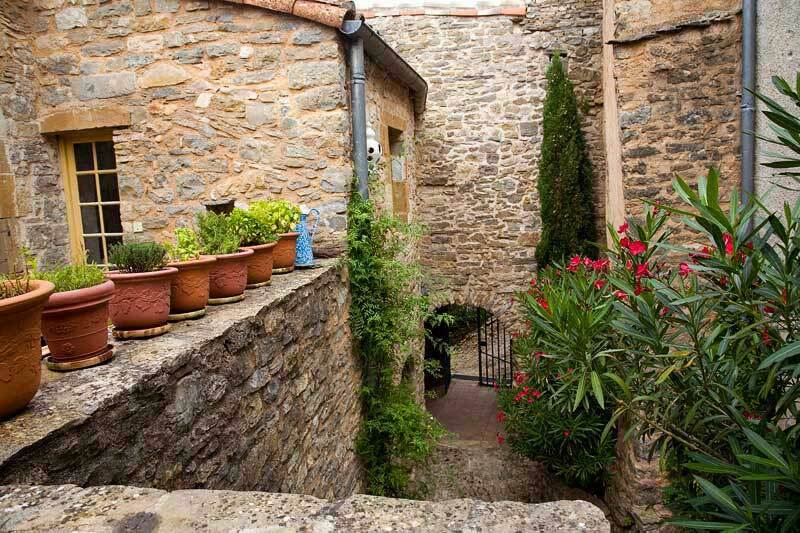 La Bastide du Haut et La Bastide du Bas connect by an inside staircase if you wish. They each have their seperate entrances and terraces if you wish to be independant. La Guest House is independant and adjacent. 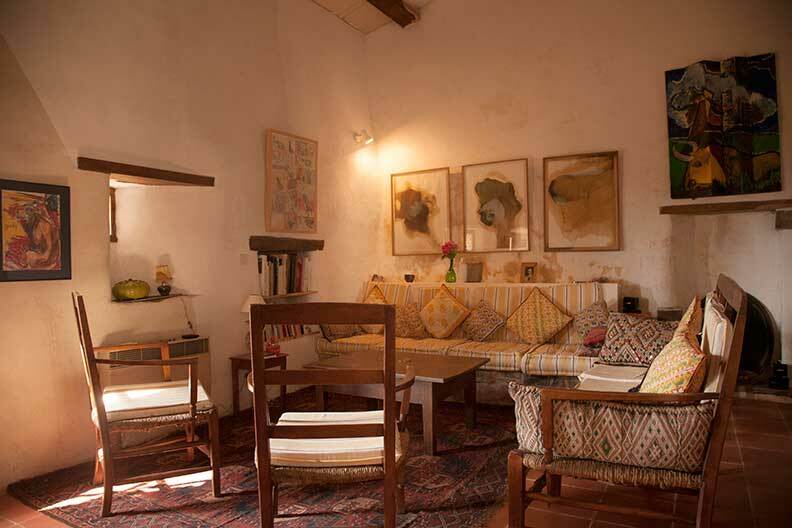 A well-restored place, much loved by the creative, colour-conscious family who have owned it for 50 years, it has two of everything: sitting rooms with fireplaces, kitchens (one outside), one terrace for privacy and peace, another for joyous gatherings. Inside, history speaks through several levels and thick old walls (some say it was the local Merovingian castle). 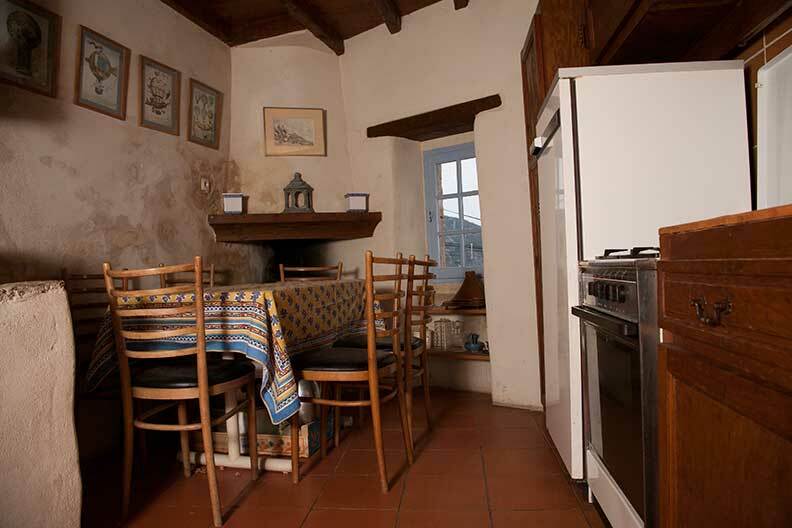 Two great old houses converted for gentle family living, linked by an inside staircase as well as terraces outside: ideal for one family of 4/5 or two families/group of frinds sharing (from 4 to 14). 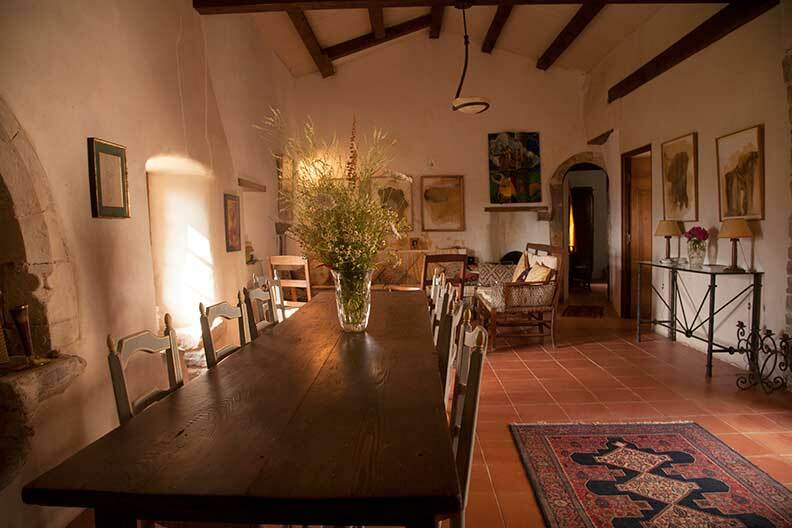 La Bastide has been created to accommodate for friendly and family gatherings. 8 Bedrooms: New beds and linens. Sheets and towels included. Multimedia: Fast Speed Internet WIFI and cable, Telephone, Stereo with turn table and big speekers. Other: Laundry machine, Tumble Dryer, Vacuum cleaners, Ironing boards, Heating, Books with several libraries. Other: Outdoor furniture, Deckchairs, Parasols. Private parking lot. 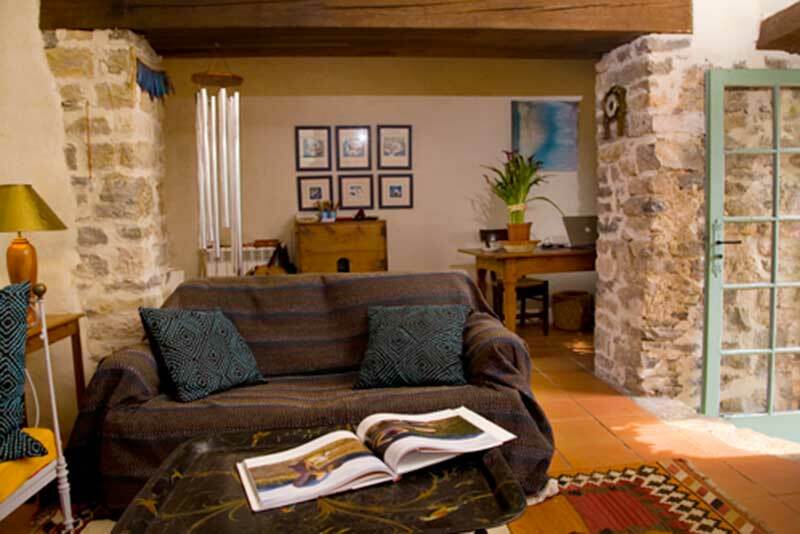 Le Haut: Upper House with 3 bedrooms and one bathroom. 1 double bedroom, 1 twin bedroom and 1 single bedroom. Bedroom 1: ’The Master Bedroom' has an extra large double bed (king) very comfortable and new. 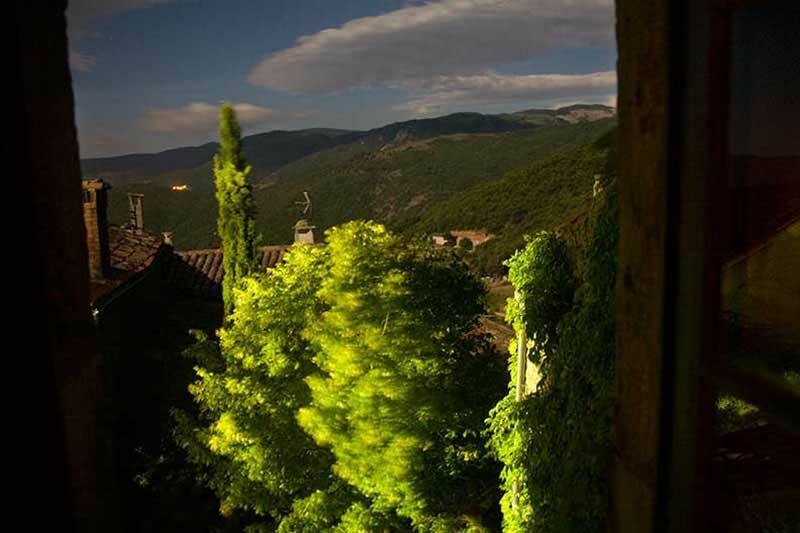 You have a view on the Cevennes and the mountains as you wake up. High ceilings of 4 meters. 'The Master Bedroom with its Studio-Family Room' adjacent to the Master Bedroom with a private living room and a desk complete with a television and Wifi. Beautiful views on the mountains with 3 full windows. Facing south and giving onto the South Terrace and linked to the Interior Terrace as well. Adjacent to the ABathroom with 2 sinks. Bedroom 2: ‘Orient Bedroom’ with two twin beds, which can be converted into a double bed. An eastern exposure, so you wake up with the Sun. High ceilings. Bedroom 3: ‘Eagle’s Nest Bedroom’ with one single bed. 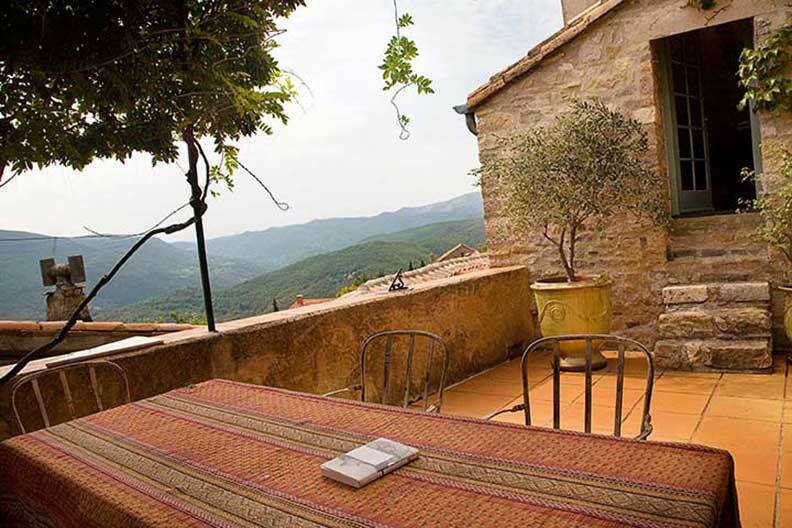 Gives onto the Southern terrace, with great views on the mountains. One big Bathroom with 2 sinks and a shower. 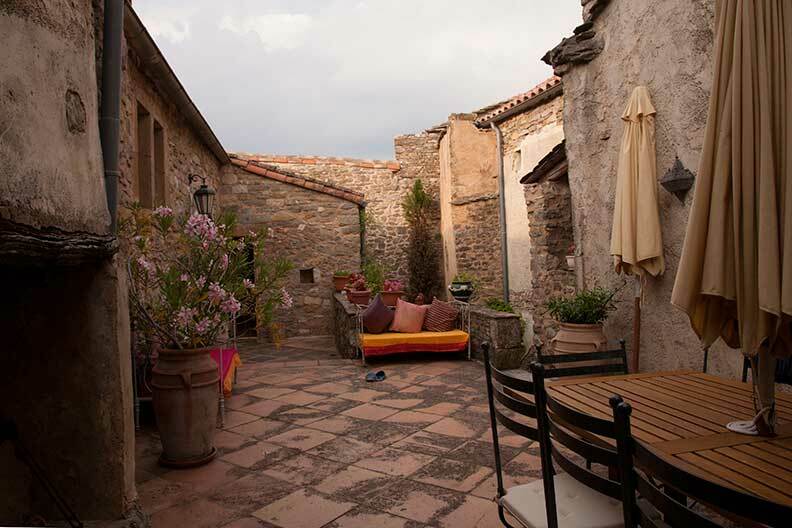 Le Bas: Lower House with 3 bedrooms and 2 bathrooms: 1 Twin and two singles. 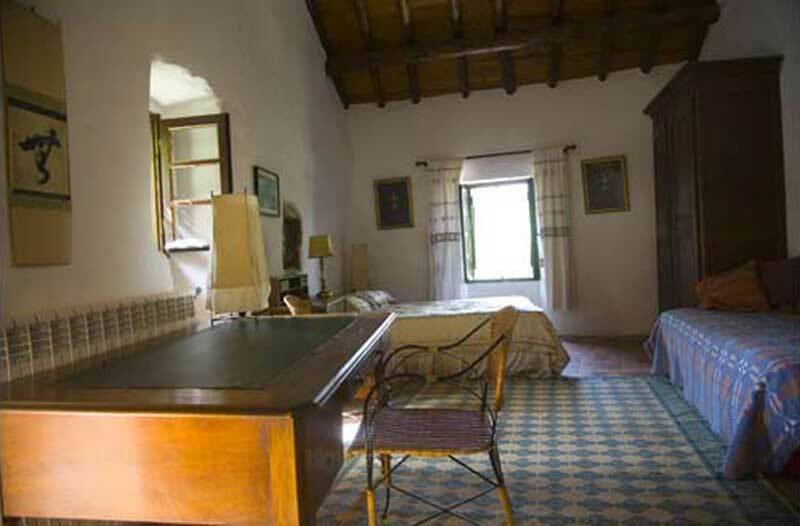 Bedroom 1 : 'La Chambre Carolingienne' . 2 twin beds all white and yellow, with white beams and its private bathroom with shower and bathtub. 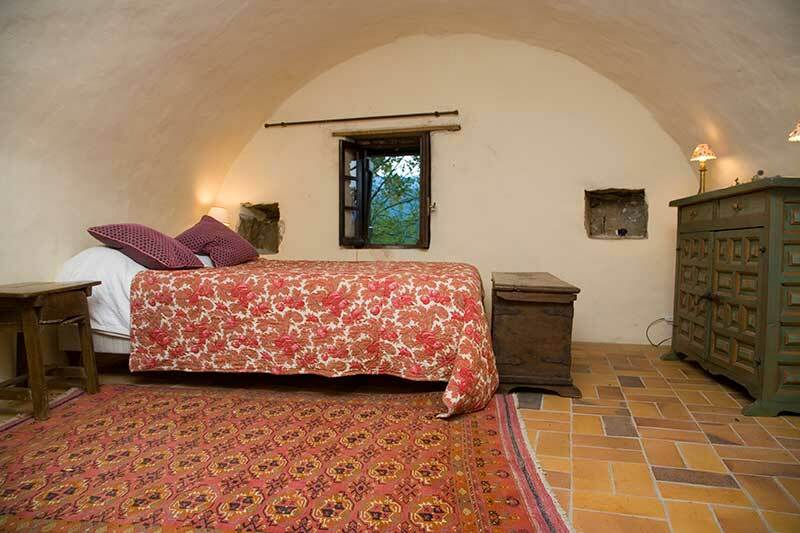 Bedroom 2: ' Chambre du Moine': One single bed in a vaulted room. Simple and intimate. 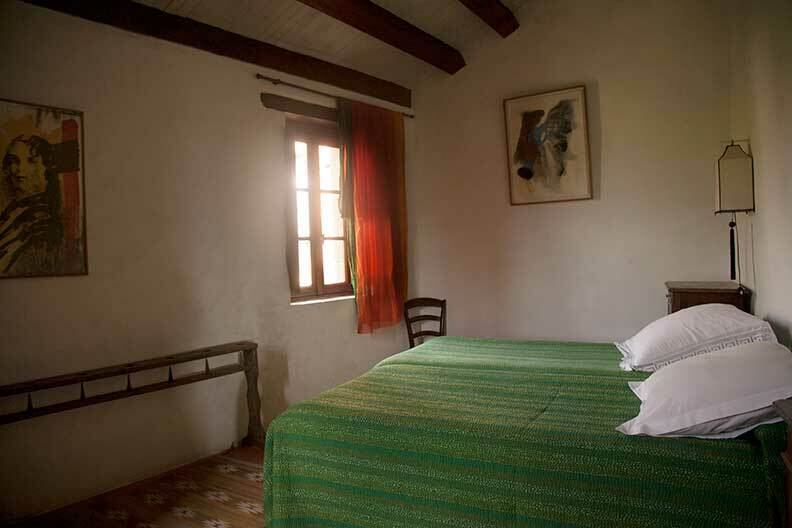 Bedroom 3 : 'La Chambre Merovingienne' with a single bed. In a vaulted room qith a big desk. Has its private bathroom. La Guest House: The Guest House with 2 bedrooms and one bathroom. Bedroom 1:' La Chambre Elevée'. A dougle bed as well as a single bed. High ceilings. Bedroom 2 : 'La Chambre Voûtée' . Big double bed with its private bathroom. Gives directly onto the Big Terrassse.